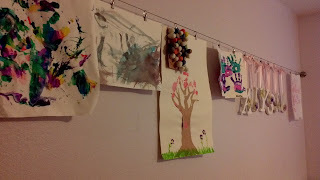 The problem: A constant influx of our daughter’s artwork from preschool; a desire to show off her work, but little time to spend re-framing new artwork. The solution: Clip the artwork and hang it from cable wire. You could put this together from items available at your local hardware store, but we used the DignitetCurtain Wire system from IKEA. It comes with corner pieces that can be hung straight out from one wall to another to span an entire wall, like we did, or at a ninety degree angle to allow you to hang the wire at any length you desire. It is sold as an inexpensive and customizable alternative to the curtain rod for hanging curtains, but we like the look and the flexibility for displaying artwork. Because it is cable wire, it is strong (the Dignitet system has a max load of 11 lb), so you could even use it in your office to keep pencil holders and other lightweight tools off the work surface. Please share your solutions for displaying children's artwork!